Know that you have the social skills, grace, style and poise to accomplish anything you choose! In this case, swan symbolism heralds the development of our intuitive abilities and altered states of awareness. In other words, we are going to be shown new ways of thinking, breathing and going with the flow of life. Like the giraffe, swan meaning also asks you to accept your ability to know what lies ahead. Therefore you should follow hunches and pay attention to your instincts. While doing this, you must also not forget to honor your feminine intuitive side. Alternatively, swan symbolism is reminding you of your inner grace and beauty. This poise is something that you must allow to shine forth for others to see. People with the swan totem can see into the future. Like the snake and the angelfish, they are also good at accepting the healing and transformation that is so constant in their lives. Folks with this spirit animal totem tend to be completely monogamous in their relationships. Thus they often find true love at a young age and will stick together through the years. They also know how to balance work, family, and play. These people with this power animal recognize the value of personal solitude as a form of recharging their batteries. They are comfortable in crowds. However, they also know how to maintain their individuality in crowded situations. Similar to the peacock, when we see a white bird of this species in your dream, it symbolizes beauty, dignity, grace, purity, wealth and prestige. It could also mean that something or someone that we may initially find to be unattractive can turn out to be very appealing. Thus it is essential not take anything at face value right now. When you have a black swan dream, it signifies mystery and the unknown. In other words, it represents something that is alluring, yet believed to be forbidden. To see this bird in your meditation could also mean that you must continue to act with grace through this difficult time. For the most part, you must believe that you will receive a spiritual reward for your perseverance. What does it mean to see two swans? Swan, Kragequa, speaks of the appreciation of the beauty that already exists all around us. Stop for a moment and appreciate the beauty of the sky, the quiet grace of a tree or the perfection of a piece of music, such as the piece by Debussey. The world is perfect and beautiful. The universe is perfect and beautiful. You are perfect and beautiful exactly as you are in this moment. There is grace in everything. Walking down main street one sunny afternoon a few years ago I noticed a finch that looked he was disoriented,as though as he may of had a bad landing and had the wind knocked out of him. I picked him up, he offender no resistance to my assistance. I wondered how long he had been there. A few blocks away there is the Thunderbird lodge, an oasis in the middle of Winnipeg’s skyscrapers and the homeless missions. Where the homeless tend to congregate because it is convient for them many places to get a meal, etc but they are concentrated all in the same area It was a few blocks away. Where i could place him in nature so he could recompose himself. I felt very good about myself walking down the street with a small bird in the palm of my hand. And grateful that I could do something for one of the creators works. As I walked I thought to myself that a man carrying a small bird in their hand is not something one sees every day.nobody paid attention to this unusual sight, I surmised it was for the same reason that no one else took the time to help a little bird in distress. Getting close to the lodge there were homeless people that certainly noticed and smiled and spoke with me to inquire about the small finches plight. I set him down on a piece of grass near the field where the sweat lodge is. I said a short prayer and offered some tobacco. The bird started perking up right away. I considered making him my pet, but birds are meant to be free. I felt a happiness that I had not felt in a long while. And that made me glad. Within the week I was walking in the same place where I noticed the finch I had helped , now without spirit , lifeless, on the sidewalk. I was disappointed that my previous effort had been to no avail. The bird may have been doing some daredevilry flying to impress a potential mate , for it was springtime. I did what I could. The little bird played by his own rules and it cost him his life. There is a lesson in this I thought to myself. At this time I was in early recovery and thought of those who tried to help me or convince me to seek help for myself, it was I , pondered , an apt analogy. I picked the bird up and mindfully interred him in a tim hortons cup , offered a little tobacco closed the lid and put him in the nearest garbage. There was nothing more I could have done for him. Two weeks later I was playing my guitar for spare change. A gust of wind blew a small feather right in front of my guitar case. It was a finches feather. I felt truly blessed. This event in no small way helped me to guide and indeed give me hope and confirmed a faith in our Creator.i offered a little tobacco to the four directions, picked the feather up and added it to my medicine bag which was gifted me the night before my mother was buried by my next door neighbor . I carry it still . In my bundle as well as my heart . All my relations ! This is the finches tale . The story of the eagle requires you consider this event for a while before the tale is told I waited 8 years . Lol. It has been three days since I wrote the above. I have been digesting a vision or whatever one may want to call it. In deep meditation where dreams may not be just dreams. You can explore this or reject this but I feel I need to share. Buk Buk ( my spirit name, which translates to Sparkling Blue Star Man ) ? Then I heard a voice ask , has he ever stolen anything ? Yes but he is not a thief . Has he said things that were untrue? Yes but he is not a liar.Has he ever used anger to attain a selfish desire . Yes but he is not a bully. Does he share with others in joy ? Unquestionably ! After a few seconds pause I was told that I was forgiven and that I had permission to forgive myself. I thought to myself , where does one start? It is as easy or as difficult as you want to make it. This story may help. Which is where the eagle comes in. It may be too early to share because it is still unfolding in my spirit. But It needs to be shared in case I get hit by a truck or something . Early one morning as the sun was rising . The time of year was near the end of medicine picking and before the salmon came to spawn. It was as though I was given the story by watching I from the viewpoint of those in it all at the same time. The subconscious mind can do much more than most can even contemplate . That is why i am so astounded and grateful for this gift. An eagle who could not fly. His wing may have been broken but I did not know for sure was swimming to shore. He could smell the smoke from the tobacco and hear the drums. He knew he was in trouble. The eagle like to fly around the village occasionally . Something about the cedar smoke and the drumming called to his inner being. The eagle could feel the echoes of their prayers from a celestial chorus. He arrived at the beach the fog started lifting and the loons lament ended. Look grandson . This eagle comes to offer himself to our village. When we observe the creator we are gifted things that we can use to honor and show gratitude. The young man was no stranger to the price to be paid for their people to have that which sustains life . He was also no stranger to giving thanks for successful hunts and respected the ceremonies when an animals life is taken. His prayer before the eagle came to shore was . Creator please help me find away to stop grandpa from offering tobacco in four directions.then killing the eagle and stick one of his tail feathers in grandpas braid. His grandfather once found a part of an eagle in the forest. He did not want to kill it either. But it was a choice. The young man mustered his strength . No grandfather it is not an offering it is a teaching. The eagle knows without our help he won’t survive he is coming to us in faith and hope. Showing us the way of coming to the creator when nothing on this earth could be of any help to him. The hope and faith of the eagle are far greater gifts than his remains. If we can help him he may return when it is his time. That is when his relics will give help in discovering the creators will. Let’s take him to aunty, she will know if anything can be done. I too have just come out of an intense and confusing relationship with who I have discovered (thanks to the internet!) is a textbook psycopath. I am a strong and spiritual woman but after only 3 months he had hooked me so cleverly and disarmed by personal boundaries that I had become confused and delirious! Thankfully I have a strong lion spirit guide who roared and got me out of there. I was left in so much emotional pain and feeling suicidal (I can hardly believe how strong and clever his energy was to break down my self esteem so quickly) .. 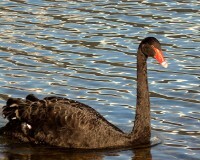 I live by a lake with ducks and geese, this morning I awoke to find a beautiful BLACK SWAN gliding on the water!! I made it through this! This intense suffering and pain creates deep and long lasting SPIRITUAL TRANSFORMATION I know it! Please have hope in the purity and love of your inner spirit. Hello all. Was driving down road & been living an absolute nightmare for close to 2 years being stalked and non stop hacking of every electronic device possible. Was at the lowest of lows. Keep praying. Got out of Vegas my home of a decade where almost no good came to me, left for fear of my life…..and after coming to a holy site on a ley line that extends through to Syracuse, praying (admittedly not as much as I should, nor have I been as grateful as I could be) I was coming from the holy site to go shower in Feb with 2 plus feet of snow & saw 2 huge beautiful swans. I so desperately wanted to take photos but it would have caused a car pile up. I’m literally & metaphorically sitting at major crossroads of my life & when I saw the spiritual meaning as a Buddhist whose previous lineage was tied to the Lakota Indians I knew God& Buddha sent them to me. Just pay attention people to the signs before your life is so far decimated, you become suicidal. Those 2 swans are helping to give me the strength to put 1 foot in front of the other. That and I believe in karma. Thanks for reading. Funny thing ,, I’ve been there and crawled out ,, I turned to spiritual enlightenment to give me a spark .. Still working on the getting life moving again but not wanting to live is gone ,, I spent 30 yrs almost in hell on earth ,, it about killed me .. Killed my spirit and I just got it back .. What you said will be hard for most to get I think ,, to truly understand it I believe you have to of lived it .. I hope others can read this and not have to suffer to learn .. Like me ..
With light and hope ..
in my dream the swan brought me thru the clean water, to the ground. That was wonderful feeling, but after that somebody kill him and I sow the other one dead in the water witch turn to be dirty ? I was using a sort of meditation method to try and find my spiritual guide. 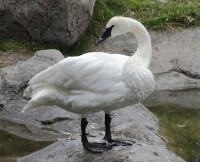 Since i am still quite new at meditation, I was met with many animals, until I finally came upon a swan. Once I met said swan, I immediately felt peace and a sort of connection. Is it possible that the swan is my spiritual guide/spirit animal? Hi, I keep seeing swans on the river in front of my house but this ONLY happens periodically when people I know have died. I have now been writing this down recently and this has happened seven times for definite and possibly a few more that I did nt write down. Can anyone help me understand what this might be telling me?? My partner is a non-believer in anything spiritual but even he is starting to recognise this pattern. I would be grateful for your thoughts. Hi!! My mother in law recently died!! We recently picked up her ashes on the 14th of August and found that there were 2 white swans arrived by our dock!! Never saw them anytime before!! A few weeks ago I had a dream that I was on a cruise ship with my mum and sisters, there were other people on the boat too as if they were on holiday. on the deck it was covered in shallow water like it was a swimming pool and swimming on the water was a man sizes two head swan. When I when up to the swan had a fit then it dead and the people on the ship started too panic as some people to started to have fits even my mum and one of My sisters, after they finished fitting my sister said did you feel that, a loud boom came from the sea and the last thing I saw was a giant tsunami moments away from hitting the ship. What does it mean???? I thank you for this website. It has well been a clear interpretation of what the animals symbolic are here for. I am a new healer and I was at a group healing event when I was told by a master energy healer that I am a swan and I needed to look up Native American folklore on the swan. She then told me that I have all the tools I need now its time for me to dance. Thanks for the information. This morning I was met with 4 black cockatoos whom landed in the trees near my home and sung and were quickly followed by 3 black swans in flight above my home?